International trade is governed by many laws and regulations and each country has its own rules surrounding how goods may be imported or exported. A Customs Broker communicates with government agencies on your behalf and ensures documents, duty and tax payments, and other requirements related to the import or export of your goods comply with these regulations. Many companies hire a Customs Broker to avoid the risks and costs of delayed shipments or fines due to errors. In this article, we look at the roles and responsibilities of a Customs Broker and the benefits of hiring one for your international shipping. 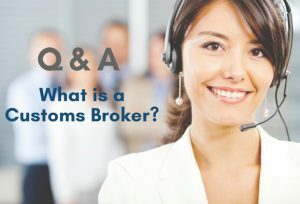 What are the Roles and Responsibilities of a Customs Broker? Post-clearance activities (e.g. accounting, applying for refunds, cancelling temporary import bonds, assisting with customs compliance audits, etc.). Customs clearance goes beyond simply selecting a tariff classification for imported goods and clearing it through customs at the time of arrival. It involves understanding Rules of Origin, free trade agreements (e.g. CETA, NAFTA), product restrictions (e.g. steel, dairy, etc. ), accounting and reporting requirements, and much more. Customs Brokers are highly knowledgeable, skilled, and experienced in customs laws and regulations and stay on top of changing policies and procedures. Outsourcing your customs clearance process can free up time and resources needed to understand customs legislation and deal with government officials, allowing you to focus on your core business. Prior to shipment, a Customs Broker will review Purchase Orders, Commercial Invoices, and other documentation to identify whether any duty savings strategies apply. Depending upon the origin, composition, or intended use of the goods, they may be eligible for relief, reduction or refund of duties (e.g. qualification under a free trade agreement or other trade program). A Customs Broker can help identify eligible products and assist in obtaining information from suppliers, as well as completing and submitting the required paperwork to customs. As an importer or exporter you are responsible for ensuring that declarations made to CBSA, CBP, and other agencies comply with import and export laws and regulations. Incorrect declarations can result in compliance audits, penalties under the Administrative Monetary Penalty System (AMPS), or confiscation of goods at the border. A Customs Broker will ensure accurate and complete information is submitted to ensure your shipments remain compliant with all applicable rules and regulations. In addition to customs clearance services, many customs brokerage companies offer full international trade and logistics services. Companies that provide integrated services – such as freight forwarding, warehousing, local trucking, etc. – offer expertise in all modes of transportation and can provide efficiencies all along the supply chain. In Canada, to operate a customs brokerage business, the broker must be licensed by the Canada Border Services Agency (CBSA). To obtain a licence at least one officer or partner must be a Qualified Officer, appointed upon successful completion of a professional exam. Ensure the Customs Broker is an established business with experience in providing the services you require. Ask if they have experience with the goods that you will be importing and/or exporting. Check to see if the broker is a member of industry associations. The Canadian Society of Customs Brokers (CSCB) is the leading authority for customs brokerage in Canada. Being a member of an industry association like the CSCB allows Customs Brokers to remain current on international trade topics and trends and maintain professional designations, including Certified Customs Specialist (CCS) and Certified Trade Compliance Specialist (CTCS). In a world where everything is going digital, it is important that the customs brokerage you select uses the latest technology. Current customs software allows the broker to transmit electronic customs clearance data to the CBSA, CBP, and other government agencies, providing efficiencies and minimizing delays in clearing your shipments. Some brokers also maintain Electronic Data Management Systems (EDMS) that allow for better reporting and quick access to your customs documents, records, and invoices. Do they offer integrated logistics services? Customs Brokers that offer integrated services, such as freight forwarding, warehousing and local delivery of shipments, understand all facets of the supply chain and can provide added value through increased efficiencies and a single point of contact for all your international trade needs. Established in 1921, PF Collins provides safe, high quality international trade and project logistics solutions to create leaner supply chains for our clients. Our integrated services include: Customs Brokerage, Customs Consulting, Freight Forwarding, Warehousing & Distribution, Immigration Consulting, and Marine Agency. We combine our expertise in import/export regulation with modern technology to expedite customs clearance and ensure your shipments arrive on-time. Learn more about our Customs Brokerage services or contact a PF Collins office today for assistance with your international shipping needs!